I have a lot of people who because I read a lot ask me what is my choice when it comes to Ebook or Paper? Well, my answer normally is whatever I can get my hands on. To be honest ever since I got my first Kindle about five years ago I have mostly read using the device. One pro I have with the Kindle or any Ebook reader is that I can always have my next read right in my hands. I keep a folder on the Kindle called Current. I use this folder to keep my next five or six books lined up and ready to go. There are times I grab another title and read it before going back to my folder. One downside with the Kindle or EReader is that at times you might want to read and if it is dead you have to wait for it to charge. This is why I have two, ever serious reader should have two or more devices to read on. And with Amazon, the devices will sync to the last page read on any device. So why in the picture above is there a paper book? Glad you asked. Revert back and you will see I said whatever you can get your hands on. 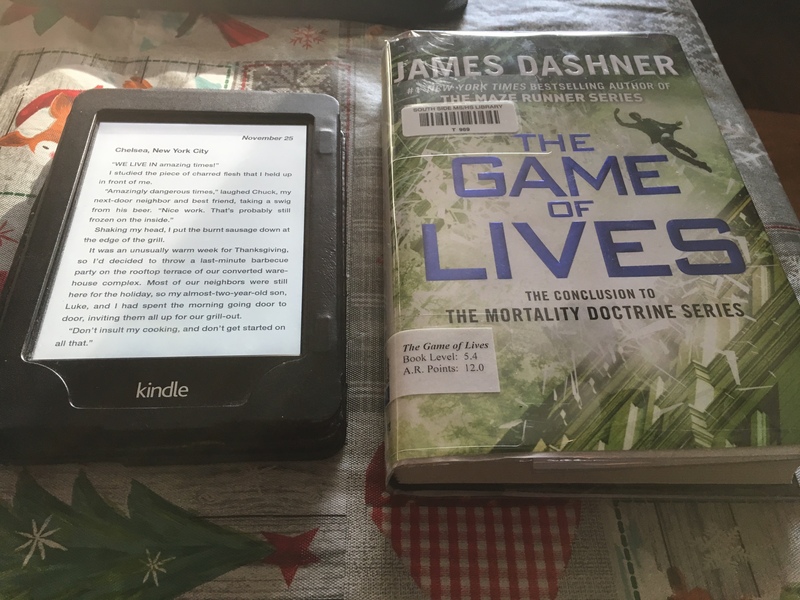 I started reading The Mortality Doctrine and finished the last book. I checked Amazon and found the price to be higher than what I wanted to pay. So I did as many readers will do and turned to the library. I was told they have the hardcover and asked if I wanted to borrow it? I said, of course, it saves me money and I get to read the next book. What I enjoy about paper books is first it never needs to be charged. And second I enjoy placing the bookmark into the book and seeing how far you have left. I know the Kindle tells you where you are at but its just something I have always enjoyed. I have many people tell me they don’t like a Kindle because it has no smell. What? Yes, books have that certain smell to them and the feel of the pages. But have you ever picked up a paper book and thought it was too large for you to ever finish? Well with a Kindle every book is the same size. Not total page counts but just the feel of the Kindle never gets bigger. It’s really all in the mind folks. Reading is something you do mostly for yourself. When we buy a larger story for the same price of a smaller one we are just getting more for our money. Don’t ever allow size to be a factor for not reading something. I would have never read many of Steven King’s books because they can get awful wordy. In the end, read whatever you can get your hands on. Reading has given me many hours of alone time spent in so many places and allows me to escape from many places I may never visit. I also feel that reading will keep your mind firing on all neurons. And my best thought is there is never any commercials that I have to fast forward over. Leaving the Home Phone behind! I have talked about this before but now I finally cut the cord to the normal telephone lines. I was able to keep my DSL using what is known as a dry loop. This is just a quick way of saying I have Internet without a dial up phone line. 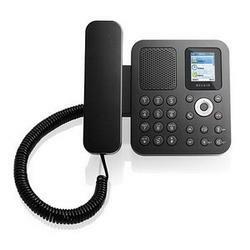 Now I am playing with the idea of using a Skype phone which is only $80.00. Then you sign up for a Skype out service for $3.00 a month for unlimited calls. Shown here is a picture of the phone. I will let you know how this goes. Well I recevied my Magic Jack a few days ago and it did install just as they said it would. I had it up and running in about 10 minutes, it takes just a little while to download the software to the computer. After the install you select a area code where you live and then it assigns you a number. My first call out was to my cell phone and it rang as expected. Next I called my new number from my cell phone and my home phone rang just as it did on Ma Bell. Now for the down side I found so far. 1st: There is sometimes a delay, you can really notice it when talking with someone in your house that you can hear through the walls, they talk and a second or so later you here it on the phone. 2nd: As you are talking sometimes you may miss what the other person is saying, they keep talking and you hear nothing on your end, SOMETIMES! I did talk with my father the last night for about an hour and no trouble at all. I did try to call my sister where I think they may not have good phones lines and I got disconnected twice. So is there some bugs, I would have to say yes. I have also been trying the Skype out service for only $3.00 a month call anyone and talk as long as you like. I have been doing this from my computer and it just works, no drops or delays. Will I keep the Magic Jack? If you are asking me today I have to say no. I think I will request a return and try another route to save on my phone bills. Should you try Magic Jack? I would say YES, just use a credit card I understand that if you use a debit card they will charge you the day you order it. This is due to some kind of banking issue not them. I will report back and let you know how the return process goes. Over the weekend my wife felt it would be nice to take the kids out to see the new Fred Claus Christmas movie. I like a movie like the next guy but why are they charging so much to get into the movies? Let’s back up a minute and have a look at my break down of prices. First you walk up to the window and tell them 5 adults? I said we took our kids to see the movie, how on earth did they become adults from the time we left the house until we made it to the mall? They were 12, 13 and 15 when we left the house now I have some movie theater telling me my kids have now grown into adults! It turns out that to be a kid at the movies you be no older then 11. I would like to meet the great moron the created this rule. Would you not like to be a fly on the wall of their house when they tell their kids this, okay sweetie we raised you up to the ripe old age of 11 and now that you are an adult you need to get a job or go to college you are now fully grown. But really there is no real saving from a child to the adult price, you will save an entire $.75 so if you have 2 young adults this should be enough to buy a drink after you get into the movies, RIGHT? WRONG READ ON!!! After leaving the window and feeling like my wallet was a little thiner in my pocket because I just paid $32.00 during the early times when families can save a little cash and enjoy the day with their kids. Now let’s move onto the snack counter. Now who can watch a movie without first getting some popcorn and a few drinks. I ordered 2 Large Drinks the kids like to share, and I ordered 2 large popcorns, why not if you order a small it is $4.00 and the medium is $4.50 and the large is $5.00 with FREE refills. Spend the extra dollar, you never know how long the movie may be and you may need a little more to snack on. Total at the counter $30.00. How many families can take their 3 or 4 children or sorry I mean 3 or 4 adults to the movies and allow them to buy a few snacks which is only fare, this is what we had when we were kids. As you can see the total for the movie was $62.00. This is the same cost that cable would cost a family for an entire month. Now the movies over and the young adults are hungry so we have to feed the troops. We stopped at a Long John Silvers and picked up really only a few items and a few drinks. Price coming to around $25.00. So for this brief few hours we got to spend with our young adults cost a whopping $87.00. Now we don’t do this every weekend and I am not really complaining about the money, I am just really upset with how the cost of everything is getting way out of control. I did see yesterday on the news that there is an actress that will not take a part in a movie for less the $25,000,000.00 that RIGHT million. This is where it needs to STOP, these people out there who call their self’s entertainers, maybe should call them self’s OVER PAID or maybe even GROSSLY OVER PAID. I use to complain about football players who are making a lot of cash flow, but at least they don’t call in a STUNT PLAYER to take their hits for them. Talking to my mother the other day, she told me there is another depression coming, so get your money out of the banks and tuck it under your bed. When the depressions hits you know who gets to take all your hard earned cash? As the cost of everything is going up and the wages are staying the same, someone or some government is getting richer and once again you or mankind will be looking for another way of life. Look for my next posting, we will be talking about gas prices.